In an effort to get rid of a lingering cough, I've been drinking lots of homemade herbal teas lately, especially this particular tea recipe and the previous one I posted just a few days ago. Drinking these herbal teas really seems to help! So, I thought I'd share another tea recipe with you, in case you were looking to soothe your throat or warm yourself up after being outdoors, especially now that the weather's getting colder. Both this recipe and the other, previously posted one are made using whole spices, which are boiled & then steeped to release their essences. This tea is delicious served plain, i.e., as an herbal tea, or with the addition of decaffeinated tea leaves, milk, & honey (chai). Directions: Bring the (4 c.) water to a rolling boil in a medium-sized sauce pot or tea kettle, about 8 minutes. Add all herbs & spices (& loose tea in a tea ball or a tea bag, if desired) & continue to boil for another 6-8 minutes. Remove from heat, allow to steep for another 1-2 minutes, strain to remove whole herbs & spices, & then pour into a tea pot. (If it's easier, use heat-proof tongs first to remove the larger pieces -- ginger, cinnamon bark, etc. -- before straining.) (Discard tea leaves/bag, if using.) Pour into tea cups, add desired amount of milk & honey and serve. Chef's Notes: Please be sure to use whole green cardamom pods (i.e., cardamom in its natural, unprocessed form) and NOT the bleached ones that are sold in generic grocery stores (i.e., the cardamom pods from McCormick's Gourmet Collection). In the latter case, not only has their color been bleached out, but so has their flavor & nutrients! Natural green cardamom smells wonderfully vibrant & heady and when you boil the pods, along with the other whole spices, they will make your whole kitchen smell absolutely divine! Green cardamom pods can be ordered online or found in a local ethnic (i.e., Indian, Asian, etc.) market. *If you're adding decaffeinated tea, I'd particularly recommend using either darjeeling, jasmine, or green tea, all of which work quite nicely with the above spice mix. The spices in this recipe provide enough flavor as is, so it's important to choose tea leaves that won't overpower or conflict with the spices' bold flavors. My version of masala chai is pretty simple. 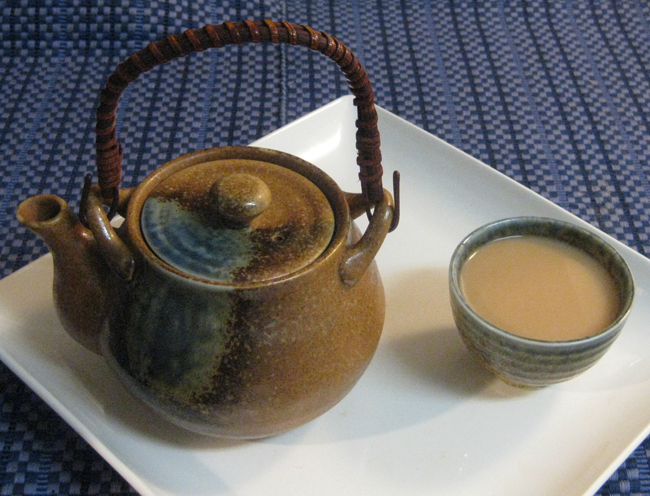 I make my masala chai in 4 easy steps, using whole spices - fennel seed, cloves, and cardamom. Other spices could be used (as above) but this is my favorite blend. If you use more than 3 or 4 though some of them start to get lost, and the flavor can get sort of "muddy".